Disney is a fun-filled family friendly vacation spot that is a bustle of activity over the summer. With kids out of school it is a great time to get away and see those beloved Disney characters. This destination does not only have to be memorable for those Mickey or Princess fans, but it can also be fantastic for teenagers and adults when you stay at a great hotel. This fact once again proves that when planning a vacation, the Best Hotel is key in ensuring a great vacation. Waldorf Astoria Orlando is one such resort. It offers fabulous amenities for the adults as well as a close proximity to all of the parks. The Waldorf Astoria is a well-known chain of hotels and the name alone promises luxury and a devoted staff. This holds true for the Orlando location, nestled in the heart of the pristine landscape in Bonnet Creek. Truly a crown jewel with over 482 acres of lush property, the Waldorf Astoria Orlando is unique. It caters to patrons wants and needs, devoting itself to guarantee that each and every guest has unrivaled accommodations and spectacular amenities. If this hotel were anywhere else in the world it would be a stylish and legendary location, but with it's close proximity to Disney it transforms into a magical destination. To make sure the kids are happy, the Waldorf Astoria Orlando offers free transport to the Disney parks via a luxury motorcoach, special activities all summer long, programs geared for little ones and of course a pretty amazing on-site pool. Adults have it made here too. The spa offers up relaxing and rejuvenating treatments and the restaurants and bars showcase original and delightful menus. There is also a championship golf course and private cabanas to rent poolside. Head out on the town to experience great shopping or a pulse-pounding nightlife, all easily attainable in beautiful Orlando. When booking your stay at Waldorf Astoria Orlando, using WhatAHotel! will allow you access to exclusive complimentary perks and benefits only adding to the allure of this impressive resort. Who knew a trip to Disney could be so chic and kid-friendly at the very same time. WhatAHotel! prides itself in offers customers the Best Hotels in your area of travel and so it would go without saying that there are other spectacular Orlando hotels as viable alternatives to the stunning Waldorf Astoria. 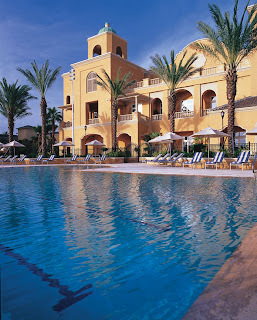 Another great options is the always elegant Ritz Carlton Orlando. This resort is relaxing and convenient to all of Orlando's world class attractions, although not quite as close as the Waldorf Astoria Orlando. Ritz Carlton Orlando offers guests championship golf, a great pool, comfortable and stylish accommodations as well as panoramic views of the surrounding lakes. When booking your stay with WhatAHotel! guests will also receive exclusive and complimentary perks and benefits including a special offer of resort credit, free nights (some restrictions apply), and complimentary transport to locale parks. If your kids are begging to visit Disney, but you are not wanting to spend your entire time away park hopping, the Waldorf Astoria can help. They give you the easy access to the park but also offer other activities to make sure that everyone on your trip has a fabulous time. Wine and dine or hit the parks, either choice will prove to be positively enchanting. 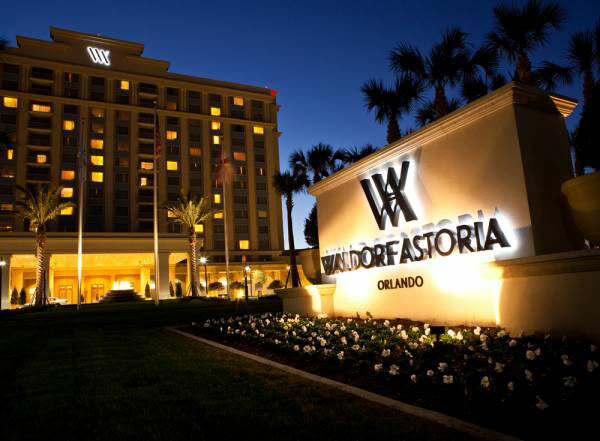 The Waldorf Astoria Orlando promises your stay in Orlando will be everything you could dream of, and much, much more.